Use the Roll20 Looking for Group (LFG) tool as a player to search for games to join or use it to list your upcoming games if you are a GM in need of a party. If you're looking to play right now, use the Pick Up Game system to find groups forming right now. You can also use the Player Directory to search for individual players looking for games, find others to form a party, or list yourself as a player looking for a home. If you are looking to play a game on Roll20, but are in need of a GM to lead you on your adventure, you can search our Looking for Group Listings page for games to join. 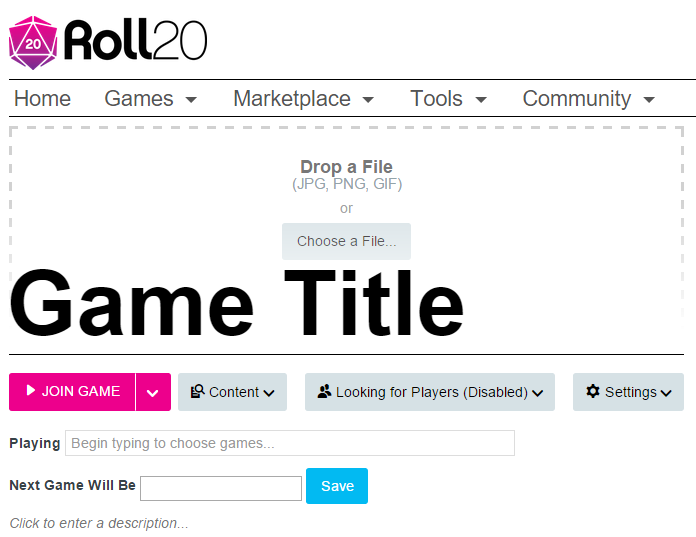 Navigate to the LFG search page once you’ve logged into Roll20 by clicking the Join A Game button on the home page, by clicking the Join A Game link from the Games drop-down menu, or by using the Join A Game button on the My Games page. All Looking for Group Listings can be viewed at the bottom of the LFG search page listed by newest added. Pick Up Games are special LFG listings that players can join immediately. They allow players and GMs to match and start playing instantly. 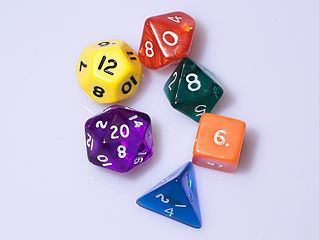 PUGs can be used to have a spontaneous game quickly with very little planning, to fill in the last few slots come game time, or replicate the convention gaming experience. 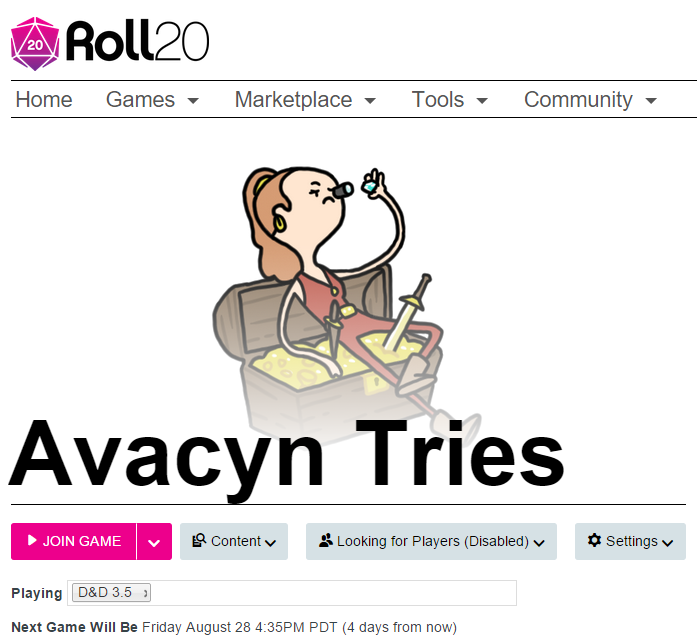 To join a Pick Up Game, visit the Join a Game section of Roll20. The right side of the page will show Pick Up Games that are starting soon, showing the starting time, the name of the game, the game system, the number of players joined and needed. Click on the name of the game to see more details. Games are listed by start time and include the start time, game name, system, and number of players. The list automatically refreshes every 60 seconds, so you do not need to reload the page to refresh the pick up game listing. To join a Pick Up Game, click the game name in the listing and scroll down to the player listing. Click the Join Game button. You will automatically join the game and can click Launch Game to enter the VTT immediately. Note: If you have been kicked from the game, banned from the forums, or if the game has already filled up, you will not be able to join the game. Creating a Pick Up Game is covered below in creating a game listing. You can also use the Find Games to Join search box to narrow down the listings to suit your needs. Click the Advanced Search Options link to reveal more search options. Once you have selected your criteria, click the blue Find Games button to view your results below the search box. When you review your Looking for Group Listings you will find a game image, information on the GM, the name & description of the game, and meta data that provides you with a snapshot of the game and scheduling details. Review the listings that match your search criteria and click a game name to navigate to its LFG listing page. The LFG listing page contains more detailed information on the game and its schedule, how many players are needed, and has its own Listing Discussion area where you can request to join the game or ask questions. If you are looking to GM a game on Roll20 but need a party to play your adventure, you can list your game on our Looking for Group page. Ensure your game is properly set up, (i.e.,Game Management) and ready to be shared by reviewing our Roll20 Crash Course. Navigate to your Virtual Tabletop once you’ve logged into Roll20. Locate the game you would like to list and click the title or icon to load the Game Details. Game details should be complete before listing a game. Set up your Game Details page completely before you setup your listing. You must include the type of game - select the Other Games option if you do not see your title listed - and date of the next game in order to post to the Looking for Group Listings. You can also add a game icon and add a description of your game. Note: When using the Other Games option you should still add your game title to your description - this will allow users to search for your game via Keyword. LFG listings are not Pick Up Games by default and must be opted into. After you create your game and LFG listing as normal, you must also check the “Pick Up Game” option in order to set the listing as a Pick Up Game. Two hours before the game’s start time, the listing will show in the Pick Up Games section in the Join a Game section. Any player will be able to join immediately and start playing. If you reach your Total Players Needed, the listing will be removed from the list. Note: Players who have ever been kicked from the game will be unable to rejoin the PUG game through this process. If the kick was unintentional, the kicked player will only be able to rejoin via a Join Link or Invitation. The games dropdown menu exist to help standardize the options available (example: 4E vs. 4th Edition vs. D&D4, etc). No matter how many games are listed, some may not make the cut. Games are added to the list periodically. This ensures obscure listings gain greater visibility when sorted via the Other Games option and helps keep away “empty” search listings for underrepresented titles. If you feel a game should be listed, encourage your community members to play and post often. The more community attention a title receives the more likely it is to be added to the list. The best way to get a game onto the list is to keep using its character sheet (if it has one) and marking your Other Games with the game's name in the description. Once all of the Details for your game have been filled in, click the Looking for Players (Disabled) drop down arrow to reveal the Manage Listing link. Explore all options on the Game Details page to add more information to your game, adjust your settings, communicate with your party, and review old chat communication in the archive. Note: The External Journal feature allows you to view your Characters and Handouts from this page outside of the main game - available to Pro or Plus accounts. Follow the link to a Create Looking for Group Listing page to begin setup. Read the page, paying special attention to the end note, and click the Create LFG Listing for *Your Title* Game button when you are ready to create your listing. Once clicked, you will be taken to your Looking for Players Listing page, now labeled (Active). If your game is still labeled (Disabled) it is likely because something is missing from your details page. The Listing Status box to the left of the Looking for Players Listing page will tell you what is missing. Fill in the Total players needed (click Save), Game Type, Frequency, Audio / Visual, Primary language, New Players are Welcome, and Mature Content(18+) information to ensure you find the players that fit your needs. 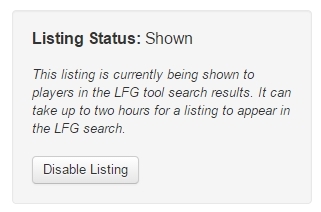 Active listings will automatically be shown to players in the LFG tool search results. Listings can take up to 2 hours to show up on the site. Where your game is listed in the LFG System is based on your game listing's specificity and relevance. Newly posted games will be placed higher on the list than older ones. Including a game description and game image also helps raise your listing's ranking. Some elements can lower your ranking such as having a game with many people in it already or not being specific enough about what game system the game will be using. If your game listing appears to be ranked lower than you expected, you may want to look into what details about your listing you may have omitted or weren't specific enough and needs some fleshing out. 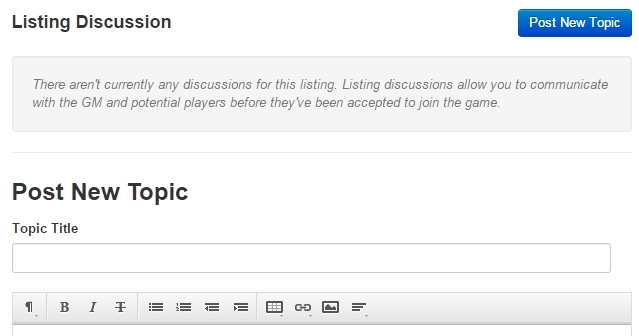 Each listing has its own Listing Discussion (forum) section where you can post information on the game and instructions on how to apply for potential new players, and they can in turn post questions of their own. 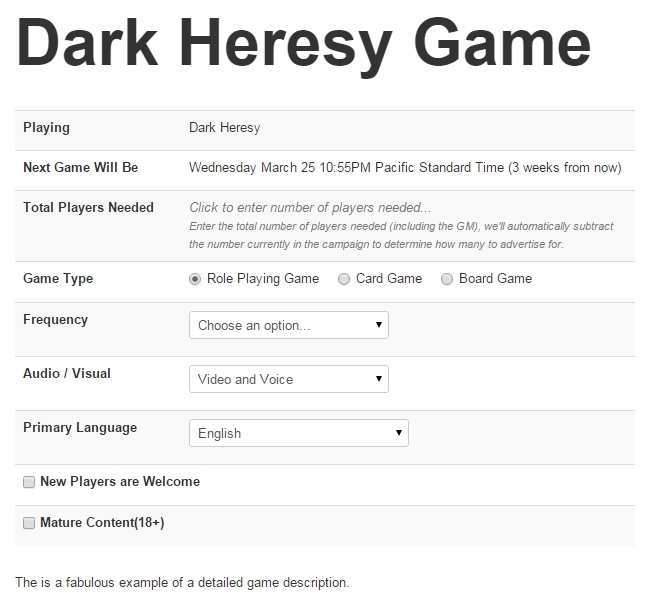 This a public board that you can use to communicate your needs as a GM and is separate from the private game Discussion Forum. When someone posts to your LFG's Listing Discussion forum, in their post a big blue button will appear by their username and all you have to do is click 'Invite' and an invitation will be sent their way. 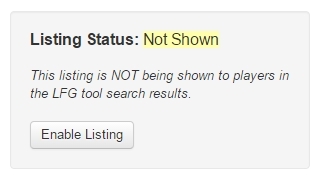 When your game is filled, your listing will automatically be disabled. You can remove your listing yourself if necessary. 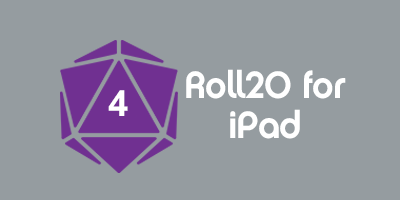 Navigate to your Virtual Tabletop once you've logged into Roll20. Locate the game you would like to unlist and click the View Details link. Look to the Game Tools area and click the Looking for Players Listing (Active) link. On the left side of your Looking for Players Listing page you will see a Listing Status box. Click the Disable Listing button to remove your game from the LFG Listings. You listing status will change to Not Shown and the Enable Listing button should now be visible for you to use if you’d like to place your game back on the Looking for Group Listings. CC Attribution-Share Alike 3.0 Unported license. This page was last modified on 4 December 2018, at 17:53. This page has been accessed 96,635 times.